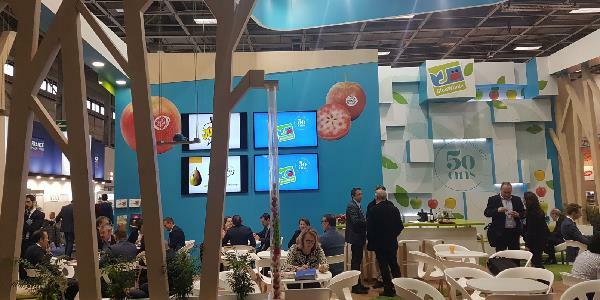 Faithful participant since nearly 20 years at the Fruit Logistica show, this 2019 edition is however special for BLUE WHALE. The brand is celebrating 50 years this year. Stand F13 Hall 22. BLUE WHALE offers around twenty varieties of apples, one of which is particularly highlighted: Candine®. Cross between the Fuji and the Ariane, the Candine® apple is marketed by BLUE WHALE which has the production exclusivity in France. The Candine® apple is colorful, juicy, crunchy, sweet with a slight hint of acidity. Very well received by consumers, the Candine® apple is starting a promising career. BLUE WHALE plans to reach a volume of 600 tonnes in 2020 and to plant 150 hectares in the next 5 years. 50 years this year for BLUE WHALE which offers the new Candine® in its wide range of apples.